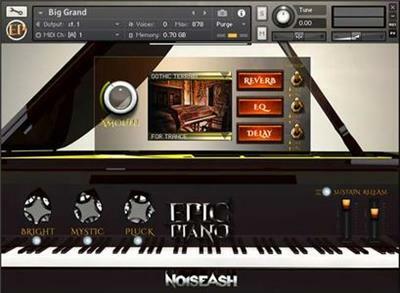 Different piano sound characters for catching the most customizable sound with an unusual 3 channel mixer engine. You don't need to do much for making it sound rich and like a pro record. Epic Piano library is not a regular piano instrument. It has lots of high-end premium quality captured samples. Over 5000 samples! Epic Theme user interface is simple and quickly customisable. This library is recorded with a Yamaha C3 Grand Piano, several mics through vintage tube preamp, tape and eq gears. Each sample has several mixed layers. So, Epic Piano sounds as a pre-mixed-mastered and high-end instrument. The sound of Epic Piano is naturally full and rich. - 24 bit, High-End Premium quality (1.8 GB, Over 5000!) Samples from Yamaha C3 Grand Piano. - Great sound for any type of piano scores. Samples are recorded on several mics through vintage tube preamp, tape and eq gears, they premixed and mastered together by our talented engineers. - Fully Customisable User Controls. (3 Special Mixer Channels, Kontakt's Internal FX units: 9 - Reverb IR's, SSL EQ and Delay FX Units). Sustain Volume and Release time faders for Advanced Automations. - Including 3 piano (and 1 FX) instruments for any kind of music genres.